June 2015 – We’ve made it two years! For our wedding, my husband Harrison and I decided to take a two-month road trip around the country to visit friends and family instead of having a big one-day blowout celebration. We called this Wedding Victory Tour (WVT), and it was one of the best decisions we’ve ever made. Not only cost-efficient, it was also much more fun for us to hang out with all of our far-flung friends, and we got to tour different parts of the country, deciding where we wanted to move next. Also, we didn’t kill each other in the car, which seemed like a good sign for our marriage. Obviously, we’re no longer living out of a car, driving around the country. (True story: as a direct result of this trip, we ended up in San Francisco, working in the tech industry!) However, I’m leaving up this blog up for posterity. Enjoy! 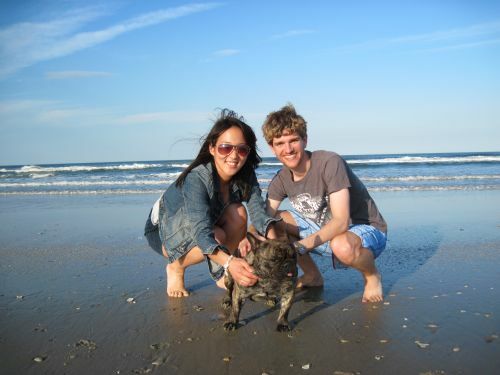 Starting in June 2013, Harrison (in board shorts) and Mica (in sunglasses) are embarking on a two-month, cross-country road trip to kick off their marriage and to celebrate their wedding with friends across the country. They plan to blog the planning and execution of this monstrous undertaking here and hope that friends, family, and Internet creepers will join along in the fun. They envision Wedding Victory Tour as a dramatic trial-by-fire fun start to their union and a way to replace the pitfalls of wedding planning with tasty nom-noms and quality time with friends and family. They will now stop writing in third person because it is late and I (Mica) am tired. Want to know more? Check out the FAQ or email us at info[at]weddingvictorytour.com!